Charles Fey dominated the gaming market with encouraging government legislature as well as limited competition. Companies like Monarch and Kalamazoo also launched their slot machines and a specific company relentlessly checked his control. There is no particular theory about what actually took place. However, the fact that Charles Fey declined to lease or sell his groundbreaking Liberty Bell machine to anyone, was known very well in the world of gaming device during that period. One theory says that, in 1905 two things were stolen from a saloon situated in San Francisco. The two things that were stolen in that robbery were a Liberty Bell machine and an apron. Within a very short period after this, Herbert Stephen Mills launched a latest adaptation of Liberty Bell slots. This was named as Mills Liberty Bell. Herbert Stephen Mills had taken over 'Mills Novelty Company' after Mortimer Mills, his father. There was a lot of competition, but Mills Liberty Bell faced it all and was very successful. At that time, Mills was using the assembly-line technique for manufacturing slot machines. Even after all the controversy, Mills became renowned as "Henry Ford of slot machines". Another theory says that Charles Fey was in partnership with Mills Novelty Company as well as produced the latest Mills Liberty Bell that shocked every competitor. 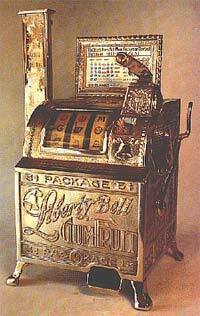 The main feature of Mills Liberty Bell was a case made of cast iron with the typical Liberty Bell was in fact cast into the facade of the slot machine. Original machines came with feet made of cast iron along with toes. However, this was removed from the later versions and ornate scrolled feet replaced them. The slot machine's reel strips depicted playing cards like Queen, King, and Jack. It also comprised of a bell. The bell used to ring when someone hit the winning combination. This was also removed from Mills Liberty Bell, thought it resurfaced after many years. The commercial losses were not the only thing that Charles Fey had to compete with, but he also suffered drastically when his factory was shattered in the earthquake. After the entire affliction, Charles Fey faded into gloom and died after some years in 1944. However, Herbert Mills' company continued to flourish.